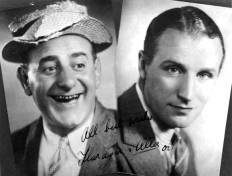 Whilst touring in a Florrie Forde show in 1926, Bud Flanagan met and teamed up with Chesney Allen. Flanagan and Allen's first inclination was to follow their main interest and start up as bookmakers, but their act was improving all the time. Their performances were so well received that they were swiftly booked by Val Parnell for a debut at the Holborn Empire in 1929. Following their 'discovery' by Val Parnell and their debut appearance at The Holborn Empire, Flanagan & Allen became part of the first Crazy Gang show at the London Palladium in 1931. 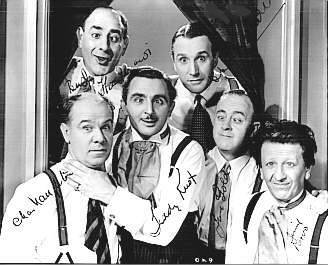 Later they appeared in Crazy Gang shows like 'London Rhapsody' and 'The Little Dog Laughed', (1939) and also some non-Gang shows such as 'Life Begins at Oxford Circus' (1935), 'Many Happy Retrurns' (1937) and, in 1933, a musical comedy at the London Hippodrome, 'Give Me a Ring'. During the war years they appeared in 'Black Vanities' (1941), at the Victoria Palace and Hi-De-Hi (1943), at the Palace Theatre. Between shows they toured the provinces , giving performances for the troops. 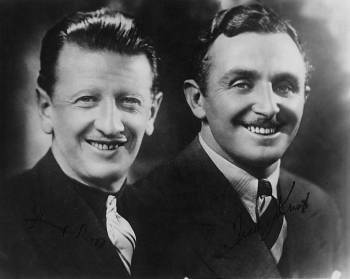 Although nominally a comedy double act, Flanagan & Allen were also known for their renditions of popular songs, the most famous of which was "Underneath The Arches." Real name: Chaim Reuven Weintrop which he later changed to Robert Winthrop. The youngest of ten children of Polish immigrants, Wolf Weintrop, the owner of a barber's shop and tobacconist's in Whitechapel, and his wife, Yetta, or Kitty, Price. He went to school in Petticoat Lane. At the age of ten he was a call boy at the Cambridge Music Hall and, at the age of twelve, made his theatrical debut in a talent content at the London Music Hall in Shoreditch, performing conjuring tricks as "Fargo, The Boy Wizard". In 1910 he sailed on the SS Majestic to New York where he jumped ship and spent years earing his living variously as a Westerm Union messenger, in a feather-duster factory, and selling newspapers, returning to England in 1915 and joining the Royal Field Artillery with whom he served in France. 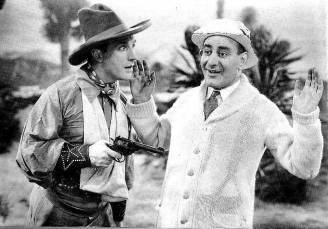 In 1919 he formed a double act called Flanagan and Roy having taken the stage name of Flanagan from his army Sergeant-Major. In 1925 he married his wife Anne, 'Curly', daughter of Johnny Quinn, who was well known in Ireland as the 'Singing Clown'. in 1926 their son, Buddy,was born. Having by now teamed up with Chesney Allen, they went on to appear in many stage shows and films as a duo and with The Crazy Gang. In 1945 ill health forced Chesney Allen to retire from the double act, and Flanagan, encouranged by Jack Hylton, decided to carry on alone. In 1947 The Crazy Gang reassembled and Bud found himself back with Nervo & Knox and Naughton & Gold when Jack Hylton brought the Gang 'Together Again' at the Victoria Palace. This was the beginning of a long run of Gang shows at The Victoria Palace until Bud retired from the Gang in 1959 at the age of 63 and was appointed an OBE. Bud and his wife Anne celebrated their 35th wedding anniversary in 1959. Bud Flanagan's voice has been regularly heard in millions of British homes for many years after his death in 1968 because, immediately prior to it, he had recorded "Who Do You Think You Are Kidding, Mister Hitler? ", the theme song for the long-running TV sitcom 'Dad's Army'. (b. Brighton, Sussex 5 April 1893, d. Midhurst 13 November 1982). Allen, whose father was a master builder, had been articled to a solicitor before opting for a stage career. As well as performing in Florrie Forde's shows, he was also her manager. Generally known as the best straight man in the business. 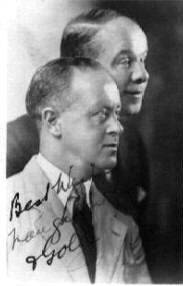 Following his early retirement from the stage in 1945, Chesney Allen became the managing director of a theatrical and variety agency, and was the Crazy Gang's manager for a time. He joined Flanagan for two more films, Life Is A Circus and Dunkirk, in 1958, and made a nostalgic appearance at the 1980 Royal Variety Performance. He also took part in the cast recording of 'Underneath The Arches, a celebration of Flanagan And Allen', starring Roy Hudd (as Flanagan) and Christopher Timothy (as Allen), which played at London's Prince of Wales Theatre in 1982. He married Aleta Turner in 1922. Jimmy Nervo and Teddy Knox teamed-up in London in 1919 to form an acrobatic dancing act and their double act went on to survive throughout their long stage careers. Over the years, their slow-motion wrestling act, always an amazing peice of burlesque, had distinguished the pair as brilliant mime artists. During the 1920s a satirical element had been added to their dancing act which made them famous in the fisrt Crazy Gang shows. Real name: James Holloway. He was born within the sound of Bow Bells, a member of his family's circus company, 'The Holloways'. His father and grandfather had both been circus owners and at the age of eight Jimmy was appearing with his brothers in a high-wire act. At sixteen, as Jimmy Nervo, he started his own juggling act. Jimmy was married to Minna Scott in 1939, who was with the D'Oyly Carte Opera Company. Albert Edward Cromwell Knox was born in Newcastle. After working as a boy juggler with his brother in an act called "The Cromwells", he went into a musical comedy show, adding dancing and comedy to his act. Teddy developed the art of the diabolo which made him a little distinctive as a juggler and, at one time, he billed himself as 'Chinko', after the great Cinquevalli, who had appeared in the first Royal Command Performance in 1912. He appeared on Broadway in 'Ziegfeld Follies of 1922'. He was married to another famous music hall star, Clarice Mayne. Naughton and Gold had the most remarkable rise to fame. The Glaswegian pair had been whisked up to London after only one appearance in a provincial music hall and had immediately been taken under the wing of Moss Empires. From then on, they survived to become the lngest running double act in the history of variety. Some ten years older than the rest of the 'Gangsters' they were an integral part of of the London pantomime scene for over thirty years from 1908. Their pantomime speciality was slapstick - splashing whitewash, chucking buckets of soapsuds and catapulting soggy dough into the gallery. These sprightly clowns had been together for 47 years by 1959 - and with the Crazy Gang for 27 years and more than 11,000 performances! Charles John Naughton was born in Glasgow and worked as a tile-fixer before going into show business. He teamed up with Jimmy Gold as a dancing act and they made their first London appearance at the Empress, Brixton, in 1912 and soon became an international top-of-the-bill act. Charlie was intrinsically funny in appearance and had the lovable qualities of the traditional clown. Wife's name: Alice. Real name: James McGonigal. Jimmy was also born in Glasgow and worked as a paper-hanger before going into show business. Generally considered as reliable and workmanlike a knockabout comedian as could be found on the British variety stage, he was never at a loss for the appropriate line to go with new material. Jimmy was the sharper, crosser, straight man, always boss of every situation. First Wife: Anna Mai Elliot; Second wife: June Nolan. Real name: Edward Earl Gray. He was the son of a Pimlico greengrocer and together with his brother, Danny, had been apprenticed to a juggling troupe and became a professional juggler at the age of nine. By twenty he was one of the juggling wizards of this country and the Continent. The juggler-comedian idea first came to him in a Paris night club when he tried his own brand of French on the audience and found that they liked it. 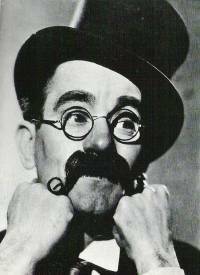 The looped moustache, horn-rims, red nose and Cockney-French accent became the trade marks of "Monsewer" Eddie Gray. By 1919 he had abandoned straight juggling to join Nervo and Knox in the first of the Crazy Shows, forerunners of the eventual Crazy Gang. Came the Thirties and Eddie eventually left the Gang to try his comedy and juggling solo act. The venture was a great success - but, after years on lone lunacy, he was homesick for the special world of the Gang, and rejoined them in 1956 in These Foolish Kings. He married Patti Loftus in 1927 and had two sons.